I made some lemon curd for a friend's birthday and my husband made labels for the jar. I just reused a 16 oz. preserves jar. Marc used cloves for eyes, and cut eyebrows and a grinning mouth into the lemon, took a picture and then made the labels that he attached with a glue stick. 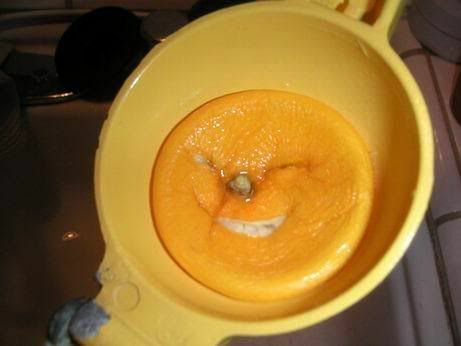 I suggest you use organic ingredients in general, but especially when you are zesting citrus, it's important because the chemicals tend to settle and stay on the peels. Finely grate zest from lemons, and squeeze enough juice for 1/2 cup (my meyer lemons were so juicy, I only needed 2 1/2 lemons to get 1/2 cup juice. Whisk juice, zest, sugar and eggs in double boiler (can just set a bowl over saucepan with an inch or two of simmering water in it). Once the eggs are well incorporated, and the sugar has dissolved, add butter, and continue whisking over the simmering water about 10 minutes. It will become opaque, lighter in color and thickened quite a bit, but still pourable. Since this recipe calls for both the white and yolk of the egg, there will be little bits of cooked white. 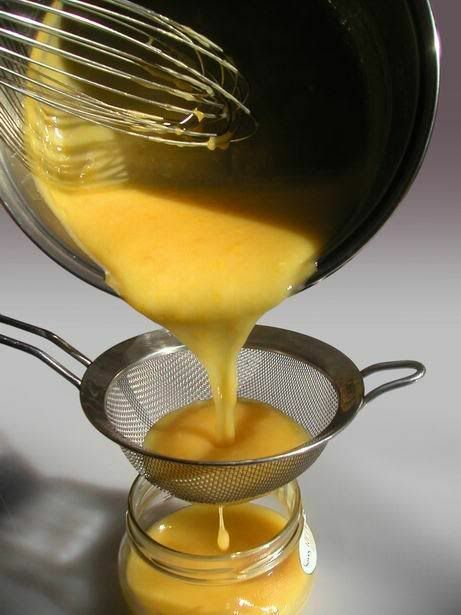 While it’s still hot, carefully pour the lemon curd through a fine strainer/sieve. This step is also why you don’t need to be too careful about the lemon seeds. You’ll have about 16 oz. of silky decadent curd that fits neatly into two 8 oz. jars. One for you, and one for a friend. Lemon curd is awesome with crepes, on toast, folded with whipped cream and served on puff pastry...you name it. Enjoy! That is truly wonderful. I need a recipe for lemon curd AND your label is fantastic. Thanks. 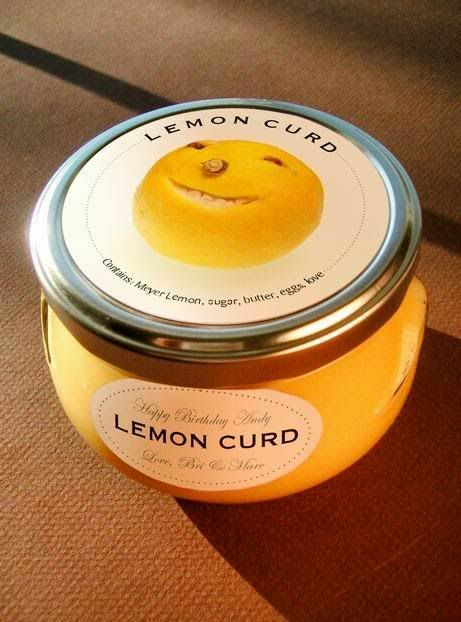 I'm not sure 100% about lemon curd, lemons=sourpussface to me....but the way you packaged it up sure is adorable and looks so professional!! that's awesome! now i have an idea for an actual Christmas present, too-thanks for posting this! That's a fantastic gift idea. I'm sure the innards are as lovely as the packaging - but it's lemon curd. Don't see how you could go wrong with that. Does this need to be refrigerated? Or will it keep okay in the jar? I have the same question. The lemon curd I make usually keeps for awhile in a regular container in the fridge, how long does yours keep? Great packaging. I see you reused a jar which is also great but does anyone know where these jars could be purchased new?